MacGregor Games, Who Are We? and what do they know about historic games? We began researching and teaching games of the past as members of Clann Tartan Historical Re-enactment -At one time the largest Scottish "living history" groups in North America. Beth didn't want to be just a camp drudge -spending weekend reenactment events cooking for 40, to 50 hungry, plaid-covered barbarians. But she didn't know a period craft which she could demonstrate. 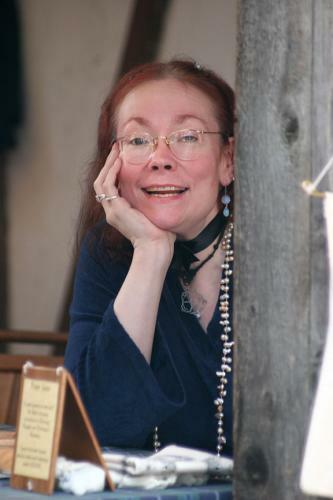 But, she did play Backgammon, and used her love of the game to create a niche for herself teaching period board games to the public at Clann appearances. I took a wooden box from a gift of wine we received as a wedding present, and painted a Backgammon board on it decorated with Celtic knotwork, and she began to use it as her toy box at events. Over the course of several years, so many people asked if any of the games were for sale, that we decided to design our own boards and began marketing them. While we do not claim to be the last word on historic games, we do take pride in our on-going research, and the wide variety of historic and regional rules we include. We are happy to answer questions whenever we can, or refer people to other sources for research help. 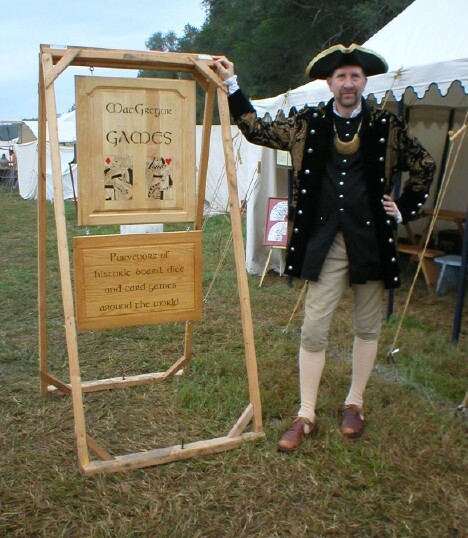 We've been in business since 1995 at the Minnesota Renaissance Festival, ( MacGregor Games at the MN Renaissance Festival booth 636/637) and appear at a number of events in the 5-state area around our base in Minneapolis. We continue to add 2-3 new items to our product line each year, and our business has been steadily expanding. Since we went on-line, our games have attracted international customers ranging from members of the Sealed Knot Society of Great Britain, to Australia's Pike & Shot Society of New South Wales. Since Clann Tartan's focus is 17th century Scotland, it has remained our goal to focus primarily on games that can be documented in Europe prior to the year 1800.
and who provide humane working conditions. If you feel the same, feel free to use our "No Sweat Shops" graphic on your web site.